This article is about the lawyer and politician from early nineteenth century Delaware. For others, see James Bayard (disambiguation). 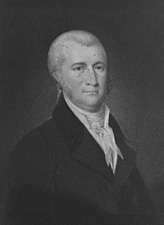 James Asheton Bayard, Sr. (July 28, 1767 – August 6, 1815) was an American lawyer and politician from Wilmington, in New Castle County, Delaware. He was a member of the Federalist Party, who served as U.S. Representative from Delaware and U.S. Senator from Delaware. Bayard was born in Philadelphia, Pennsylvania, son of Dr. James Asheton Bayard and Ann Hodge. The Bayards descended from a sister of Dutch Director-General Petrus Stuyvesant and came to Bohemia Manor, Cecil County, Maryland in 1698. Upon the premature death of his parents, the younger James went to live with his uncle, Colonel John Bubenheim Bayard, in Philadelphia. He graduated from Princeton College in 1784, studied law under General Joseph Reed and Jared Ingersoll, was admitted to the Delaware Bar in 1787, and began a practice in Wilmington, Delaware. Bayard married February 11, 1795, Ann or Nancy Bassett, the daughter of wealthy Delaware lawyer and U.S. Senator Richard Bassett. They had six children, Richard, Caroline, James, Jr., Edward, Mary, and Henry M. and lived on the southwest corner of 3rd and French Street in Wilmington. Bayard was first elected to the U.S. House of Representatives in 1796, and served there for three terms, from March 4, 1797 until March 3, 1803. While in the U.S. House "he was distinguished as an orator and constitutional lawyer and became a leader of the party in the house." He especially distinguished himself as one of the managers appointed in 1798 to conduct the impeachment proceedings against William Blount, a U.S. Senator from Tennessee. Blount was accused of inciting the Creeks and Cherokees to help the British take New Orleans from the Spanish. While the U.S. House impeached him, under Bayard's leadership, the United States Senate dropped the charges in 1799 on the grounds that no further action could be taken beyond his dismissal. This set an important precedent for the future with regard to the limitations on actions which could be taken by U.S. Congress against its members and former members. Bayard also played an important part in the U.S. presidential election of 1800. With the vote tied in the Electoral College, it was a group of Federalists led by Bayard who broke the deadlock by agreeing to allow the election of Thomas Jefferson by the House of Representatives. When it seemed the Federalists were about to vote for Aaron Burr, Bayard is believed to have followed the advice of Alexander Hamilton and persuaded his Federalist colleagues to abstain from voting. It was also believed he struck a deal with the incoming Jefferson, to refrain from the wholesale removal of Federalists from appointed positions. The young Bayard enlisted Representative Samuel Smith (Maryland) to deal with Jefferson on Federalist control of the Philadelphia and Wilmington custom offices. While that was never proved, Jefferson allowed the Federalist office holders to remain employed. Just before John Adams left office as U.S. President he used the provisions of the Judiciary Act of 1801 to make many "midnight" judicial appointments. Among those was Bayard's father-in-law, Richard Bassett. Resigning as Governor of Delaware Bassett took a position as a federal judge, but soon was out of work when Jefferson had the act repealed. Bayard himself declined an appointment as Minister to France offered by President John Adams in 1801. So effective was Bayard in opposing Jefferson's government that all out effort was made by the Democratic-Republicans to unseat him in his attempt at a fourth term in 1802. Caesar A. Rodney, nephew of the Revolutionary President of Delaware Caesar Rodney, beat Bayard by 15 votes. However, two years later, in 1804, the result was reversed with Bayard besting Rodney. In the best Delaware tradition, the two remained friends throughout. Although elected to the U.S. House in 1804, Bayard never returned there, because before the term began, on November 13, 1804, he was elected by the Delaware General Assembly as U.S. 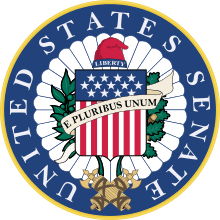 Senator, filling the vacancy caused by the resignation of William H. Wells. He began a term of his own the following March 1805, was reelected six years later, in 1810, and served until his resignation on March 3, 1813. By his own admission, it mattered little who represented Delaware, if they were a Federalist, because the party was in such a minority. Like most of his party, Bayard opposed "Mr. Madison's War" as the War of 1812 was sometimes scornfully called, but like the Democratic-Republicans, he was outraged at the British actions on the high seas and recognized the need for action. As the possibility of war became more likely, he urged caution, thinking of the lack of preparedness of the military and especially of the vulnerability of coastal Delaware. On June 17, 1812, he was one of 13 Senators to vote against declaring war. However, once the war began he and all Delaware Federalists wholeheartedly supported the effort, avoiding the suspicion of treason earned by Federalists in New England. Because of that support, he was the only Federalist appointed as one of the peace commissioners who eventually negotiated the Treaty of Ghent. Resigning his Senate seat he went to Europe and played a major role in the negotiations that ended the War of 1812 when the treaty was signed in December 1814. Subsequently, President James Madison offered him an appointment as Minister to Russia, but Bayard declined, believing a Federalist could hardly well-represent a Democratic-Republican administration. Bayard was elected a member of the American Antiquarian Society in July 1815. His disposition on membership is unknown, as no known correspondence confirms or denies his interest, and his death was only a few weeks after his election, and a few days after his return from Europe. After spending several months in Europe, Bayard returned home in the summer of 1815. During the trip he developed an inflamed throat and became critically ill. He lived only five days after his return and died at Wilmington. He was originally buried on Bohemia Manor, in Cecil County, Maryland. In 1842 his remains were removed, along with those of his father-in-law, Richard Bassett, and reburied in the Wilmington and Brandywine Cemetery at Wilmington. Bayard was the father of two U.S. Senators, Richard H. Bayard and James A. Bayard, Jr., grandfather of another, Thomas F. Bayard, Sr. and great grandfather of another, Thomas F. Bayard, Jr.. He was sometimes known as The Chevalier, the Goliath of his Party, and High Priest of the Constitution. Elections were held the first Tuesday of October. U.S. Representatives took office March 4 and have a two-year term. The General Assembly chose the U.S. Senators for six years that also began March 4. In this case he was initially completing the existing term, the vacancy caused by the resignation of William H. Wells. ↑ "BAYARD, James Asheton, Sr.". 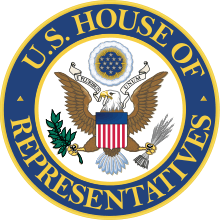 Biographical Directory of the United States Congress. United States Congress. Retrieved 5 December 2013. ↑ Ackerman, Bruce (2005). THe Failure of the Founding Fathers: Jefferson, Marshall, and the Rise of Presidential Democracy. Cambridge: The Belknap Press of Harvard University Press. p. 106. ISBN 0674018664. Borden, Morton (1954). The Federalism of James A. Bayard. pp. 91-93. Hoffecker, Carol E (2004). Democracy in Delaware. Wilmington, DE: Cedar Tree Books. ISBN 1-892142-23-6. Munroe, John A. (1954). Federalist Delaware 1775-1815. New Brunswick, NJ: Rutgers University. Biographical Directory of the United States Congress; portrait courtesy of the Library of Congress. "Bayard, James Asheton". Appletons' Cyclopædia of American Biography. 1900.